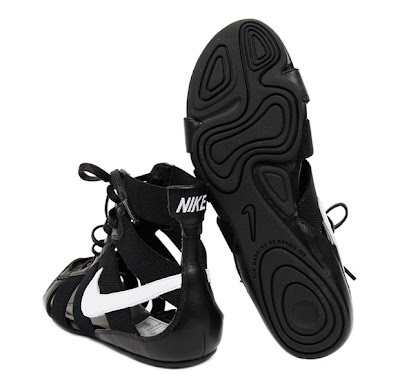 Sneakers are for the gym, that is a philosophy to which I have long adhered. If you've seen me out in sneakers, consider yourself lucky -- I've only worn sneakers out of the house once this year (twice, if you count the once I've been to the gym in 2009) and it was only because it was raining and I was cranky. 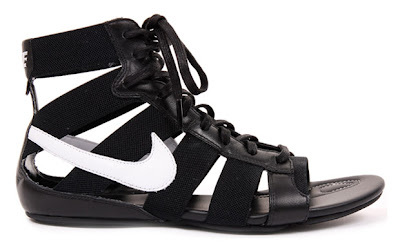 Nike, it seems, has cottoned on to the fact that there are others like me, and is trying to convince my mind and wallet that these gladiator-style sneaks are far enough from the sneaker family that I may be convinced to indulge in them. From an aerial perspective, they kind of are... or maybe I'm just a sucker for anything that looks anything like a close cousin of the Ann D lace-up boots. And then switch over to the side and out pops that SWOOSH, like a shiny decal sticker on your brand new BMW: totally unclassy and unnecessary. Much more enticing, among the sneaker-fashion hybrids, is the satiny selection from Sergio Rossi for Puma. The classic sneakers are almost tasty, with those sherbet hues -- mint, grape, blueberry -- but it's the shoe silhouette that's winning fans. That said, these are actually two sides of the same coin. Nike is doing practical wear with a fashionable edge, whereas Sergio Rossi/Puma are doing fashion with a sporty influence. Whatever the goal, I wouldn't be caught dead in the Nikes. 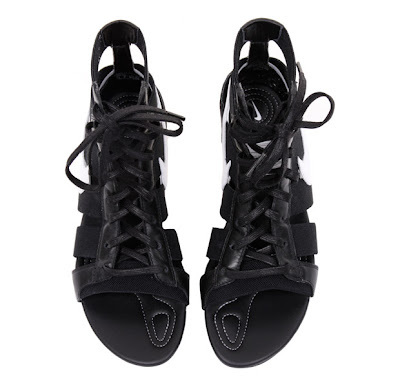 But I might just show up to the gym in heeled sneakers, no matter how ridiculous that sounds.